Could you write down Java static methods best practices? What is Java static methods in interface? Have a question on Java static methods vs singleton? In Java Variables can be declared with the “static” keyword. When a variable is declared with the keyword static, it’s called a class variable. All instances share the same copy of the variable. A class variable can be accessed directly with the class, without the need to create a instance. Without the static keyword, it’s called instance variable, and each instance of the class has its own copy of the variable. The static variables are shared among all the instances of the class. One of the main reason you need it when you want to do lots of memory management. For all static variable – there will be only one single copy available for you to use. You absolutely don’t need an class object in order to access static variable. 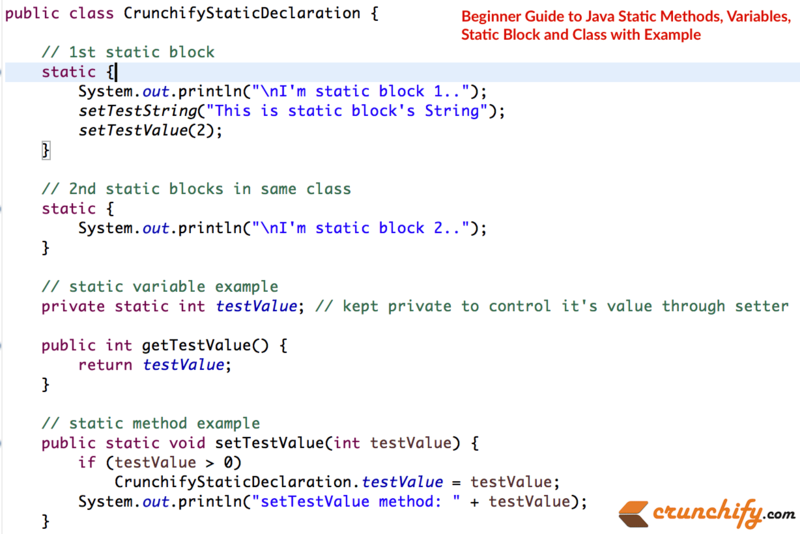 The static block, is a block of statement inside a Java class that will be executed when a class is first loaded into the JVM. Can you override private method in Java? Well, no. Private methods can’t be override as it’s not available to use outside of class. Why can’t we override static methods in Java? Can we access non static variable in static context? To be able to access non static variable from your static methods they need to be static member variables. How to identify? Just check this first. Do you need an class object to access static method? If you don’t need an object then it’s Static method. Better use keyword static if that method is not going to change throughout your project at runtime. You can’t override static method. * so it is "non-static". It can't be called unless it is called on an instance of CrunchifyStaticMethodMain. * then you could call: CrunchifyStaticMethodMain.crunchifyTestMethod(arr); within main without having created an instance for it. Check it out the explanation in above code block. We have to create instance of Class to access non-static method. can we use THIS keyword for static instance variable? Hi Kiran. We can’t use THIS Keyword inside static blocks static methods. This is true with super() keyword. You wrote : A static method can call only other static methods and can not call a non-static method from it. How at all is this true ???? we call lots of method from main() method which is also static , by creating object of the class. I mean, we can call non-static methods from static method by creating object of the class. Hi Amrita – you can’t call static method directly from main() method. You need to create an instance of your OTHER CLASS and then access those methods inside main(). Hope that’s clear. As per your explanation, static methods can call only static methods. But the main method in java is also static. How is it able to call other methods? Hi Deepthi – you can’t call static method directly from main() method. You need to create an instance of your OTHER CLASS and then access those methods inside main(). Hope that’s clear. I’ve updated above tutorial and added example-1 with it. Thanks for posting comment Deepthi though. Are there any advantages or disadvantages of Static Methods over Static Blocks? When you should use Static blocks, to your advantage? I like the way you completely described “Static” concept in Java. I did not understand exactly when static blocks are executed, in novice terminology. I mean, exactly when ALL the classes, with static blocks, are first loaded in to the JVM? Is it when the main method is executed? or before? If there are few classes in which order they are loaded and their static blocks will be executed in that order. So ALL the static blocks from ALL the classes will be executed even before the main method starts executing? The class itself will be initialized when you first reference it. So in this case, whenever you have `CrunchifyStaticDeclaration` in your code, the static block will be executed if it hasn’t been executed before. Thanks for this short clear notes. I just want to know.. Can we access a variable in a method in different class? if yes can you share an example? Nice little tutorial, good to start with, but there are lot more to learn about static e.g. what happens if you call a static method with null reference? It’s in general also a good practice to do so yourself. Even the average IDE would warn you about accessing static methods through an instance, at least Eclipse does here.